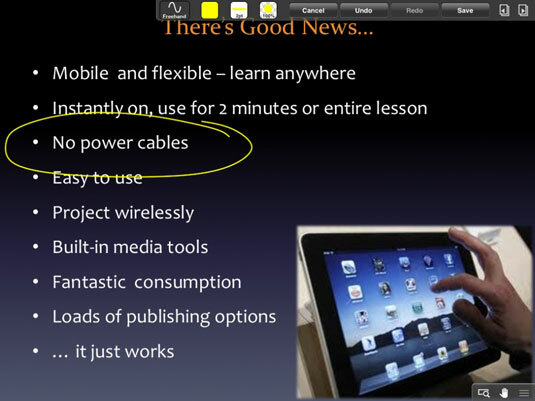 Teachers who prefer to create their educational presentations with PowerPoint can present them on an iPad using the GoodReader app when needed. Present PowerPoint slides as you formatted them using GoodReader iPad app.To use GoodReader to display your PowerPoint presentation, you must first use the export function in PowerPoint and export your presentation as a PDF. If you’re familiar with PDF files, you know they are static documents, which means you lose any animations, transitions, and video in your presentations. If that’s not an issue for you, the PDF export function might work well as a solution for presenting your PowerPoint slides. After you convert your PowerPoint presentation to a PDF file, you can use any PDF reader on the iPad to display it. GoodReader iPad app is especially good;. It will actually also open your PowerPoint file directly. PowerPoint creates a PDF file with single pages for each slide in the presentation. GoodReader then presents each page/slide of your presentation as a full-screen image, and you can flick through slides one at a time as you would in a regular presentation. GoodReader allows you to annotate PDF files; you can select the Pen tool and draw on a slide with your finger or a stylus as you are presenting.